Which of the 16 major start of categories in information technology will reap disproportionate share of investment dollars in 2016? And which sectors are closely guarded secrets shielded by seed investors, that may have their breakout year this year? 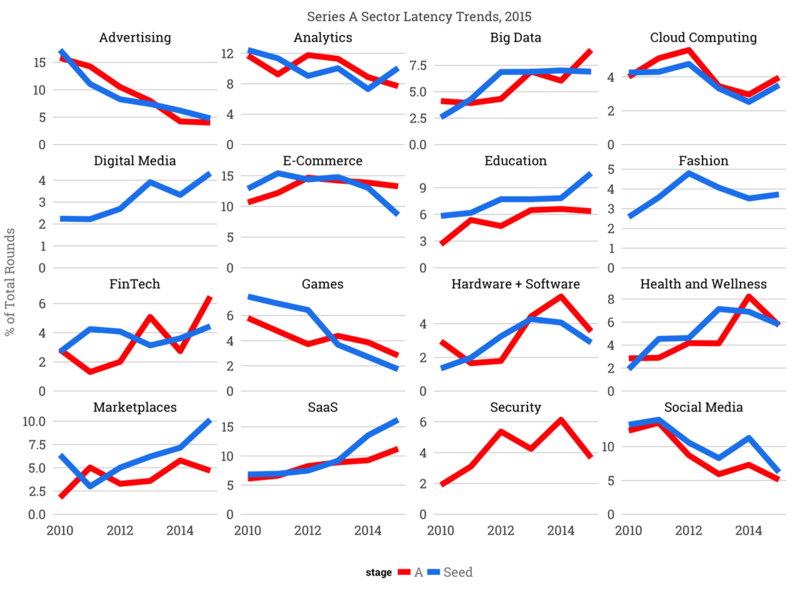 Using Crunchbase data, I analyzed share of dollars commanded by each of these 16 categories over the last five years to understand the trends in both the seed and series A fundraising markets. The chart above contrasts the pace of investment across the two markets by sector measured by % of total dollars invested anually. Seed investment is marked blue, and series A investment is marked red. Advertising has seen its share of both series A and seed dollars fall from 15% to 5% in just five years, and indication of how out-of-favor this category of business has become amongst investors, because of the dominant network effects of Facebook and Google. Analytics remains an important category for both markets. Startups building analytics products command roughly 10% of both seed and series A dollars. Big Data, a term popularized in 2012 that has reached its apogee in 2015 according to Google trends increased from 2.5% of the market in 2010 to more than 7.5% of the series A market in 2015. Seed investors’ interest in Big Data has remained constant over the last four years while series A investors’ appetite continues to grow. Cloud computing, which encompasses the infrastructure products used by developers to build services, has remained flat at 4% over the past five years despite some recent declines in 2013 and 2014. Amongst investors, Digital Media is witnessing a renaissance growing from 2% share to 4% share in three years. Series A investors, though, have not shown has keen of an interest, or at least not yet. This may be a breakout category in 2016 for Series A investments. The challenge for digital media companies in the past has been the valuations at exit. Media companies trade at lower multiples than traditional software companies, but the impressive growth of new entrants like Upworthy may entice investors to reconsider. A perennially important category, e-commerce is constant in the series A market at 15%, but declining in the seed market, falling from 15% below 10% in 2015. E-commerce companies require more capital in order to grow, in part because the margin structure is lower than software companies, and these businesses require a fair amount of working capital. The decline in seed interest may indicate seed investors expect an increase in cost of capital in the next few years, and consequently the follow-on dollars to finance e-commerce startups may not be available at the attractive terms they once were. Since 2010, education startups have been on a tear in the seed market growing from 6% to now 10% in 2015. During the period, we two salient education companys have gone public: 2U, a SaaS online college company worth $1.3B and Instructure, a learning management system business worth $550M. Disclosure: Redpoint are investors in 2U. Seed investors continue to invest roughly 4% of their dollars, but series A investors have not followed over the past five years. FinTech, which includes startups in the Bitcoin ecosystem, have seen good and bad years, with a whipsaw decline in 2014, in which the early winners of the movement benefited from a massive increase in follow-on rounds, but new companies were starved for capital, followed by a banner year in 2015. Games continues to suffer a steady decline from 7% of dollars to fewer than 2% of dollars. Exits in this category have been harder to come by than expected, with the exception of King.com. Meanwhile, high-flyers such as Angry Birds’ parent company Rovio haven’t been acquired or gone public, while facing increasing competition in the ecosystem and pressure to diversify their offerings. Hardware/software combinations, category that includes connected devices like Fitbit, crested in 2014 had more than 5% of series A dollars, before falling to under 4%. Despite embracing combination hardware software companies at IPO, the public markets have not sustained high multiples for these businesses. GoPro lost 73% of its market cap in 2015 and FitBit is down 44% from its August 2015 high. Health and wellness companies continue to receive increasing amounts of early-stage capital through 2014 before suffering a mild decline in 2015. The interest spiked around the ratification of Obamacare. Marketplaces have rocketed from a 2.5% share of seed dollars to now 10%, buoyed by the massive successes of Uber and AirBnB. Uber is the largest taxi company in the world by market cap, but doesn’t own any taxis and AirBnB is the largest hotelier in the world by market cap, but owns no real estate. The astronomical growth rate and size of these businesses have seen investors pursuing new and novel categories, meanwhile’s series A investors have remained steady at 5% of dollars. Given the amount of seed investor interest, I expect many of these marketplaces to raise series A dollars in 2016. SaaS companies following a similar trajectory to marketplaces, where seed investors are outpacing series A investment, but both are increasing their allocations from 5% to 15% and 10% respectively. The opportunity here, as readers of this blog will know, is still quite large, with less than 2% of traditional software market capitalizations having transitioned to SaaS, including the private company cohorts. Security is the one category where series A investors invest substantially more than their seed counterparts. Series A investors allocate roughly 4 to 6% of their dollars each year to security companies, while Seed investors spend less than 1% in this category. If the persistent drumbeat of breaches and data leaks are any indication, we should expect more investment in security. Precipitated by Facebook’s dominance in the category, setting aside a few outliers including Snapchat, social media investment has fallen from 15% to 5% across early-stage investors. This drop is highly correlated to the advertising implosion. Both businesses are intricately intertwined; social media businesses generate proprietary data assets that are used to create unassailable advertising platforms. Because of the increasing network effects Facebook imposes on both ecosystems, investors historically have perceived less and less opportunity in both of these categories. In conclusion, big data, education, marketplaces, and SaaS should see strong investment activity in 2016. Advertising, games, and social media will likely see similar years to 2015 unless there is a discontinuity in those markets. Perhaps digital media and fashion companies will break out from the seed investment market into the series A market. And it remains to be seen whether or not seed investors will follow their series A counterparts into security investments.